For undergraduate courses in Mechanical, Industrial, Metallurgical, and Materials Engineering Programs. For graduate courses in Manufacturing Science and Engineering. Manufacturing Processes for Engineering Materials addresses advances in all aspects of manufacturing, clearly presenting comprehensive, up-to-date, and balanced coverage of the fundamentals of materials and processes. With the Sixth Edition, you'll learn to properly assess the capabilities, limitations, and potential of manufacturing processes and their competitive aspects. The authors present information that motivates and challenges for understanding and developing an appreciation of the vital importance of manufacturing in the modern global economy. The numerous examples and case studies throughout the book help to develop a perspective on the real-world applications of the topics described in the book. 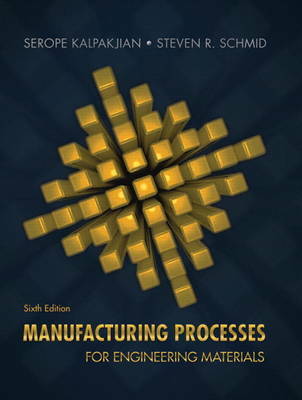 As in previous editions, this text maintains the same number of chapters while continuing to emphasize the interdisciplinary nature of all manufacturing activities, including the complex interactions among materials, design, and manufacturing processes.